Sid Miller, left, and Trey Blocker to square off in a heated race for agriculture commisioner. Vying for the Republican nomination are current Ag Commissioner Sid Miller, who is known for a number of high profile controversies and a bombastic social media persona, and Trey Blocker, a sixth generation Texan with a family history of cattle ranching and an equally snarky online bravado. In the short time since last week's filing deadline, they’ve already thrown gentlemanly behavior out the window. Professor Mark Jones with Rice University’s Baker Institute of Public Policy said these social media posts may influence Texas voters in the Republican primary. “I think in part that’s because many Texas voters don’t really know what the ag commissioner does, and therefore you’re going to see campaigns focus on errors or problems with one candidate or another as opposed the candidates' policies related to the duties of the state’s agriculture commissioner,” Jones said. And what the state’s Department of Agriculture does includes regulating scales at the grocery store and providing consumer protections on gas pumps. But Trey Blocker said he’s getting the agriculture commission out of that work. Miller, however, says that’s absurd. “Well, he’s going to have a hard time doing that. Those are statutory functions; we have over 130 statutory functions that are mandated to us from the Legislature that we perform those functions,” Miller said. Since announcing his candidacy, Blocker also criticized Miller for raising fees on farmers and ranchers his first year in office. “Sid campaigned as a conservative, small government Republican, and he has proven himself to be a big government liberal in a lot of senses,” Blocker said. “He has raised fees on farmers, ranchers and other small businesses that exceed in the amount of 500 percent." According to the state auditor’s office, in Miller’s three-and-a-half years as Texas agriculture commissioner, those fee increases led to a $700 million surplus for those programs. If elected, or re-elected, both Blocker and Miller say they plan to return those extra funds to Texas farmers and ranchers. Another big issue for the Texas ag commissioner: commodity prices. Over the last several years, the prices of agricultural products have been unstable, leaving many farmers and ranchers uncertain if they’ll be able to turn a profit. One way Miller says he’s worked to change that: finding international buyers. That’s something he’ll campaign on, but most voters are more likely to associate him with calling Syrian refugees rattlesnakes on his Facebook page or the Texas Rangers investigation into taxpayer funded out-of-state trips, including Miller’s visit to an Oklahoma doctor to receive a restorative concoction known only as the “Jesus Shot”. On the quieter side of the ticket is Kim Olson, the Democratic nominee. “I truly believe the electorate is worn out from all of the negative things out there, but this gal is going to run for Texans; she’s going to represent all Texans because at the end of the day everybody eats,” Olson said. Olson owns a farm near Mineral Wells and often boasts about her 33,000 “head of livestock” there — her 33,000 bees, that is. She’s also a retired Air Force colonel, and she calls Texas’ — and the country’s — agricultural systems a national security issue. “When you have the capacity as a nation to feed your own country and then export food all around the world, that makes you a powerhouse,” Olson said. But despite Olson’s more candid approach to politics, Jones knows where the action will be. “Definitely looks like we are going to have a divisive and vitriolic primary between Sid Miller and Trey Blocker,” Jones said. After all, Texas has had a Republican agriculture commissioner since Rick Perry won the position in 1991, which predates Twitter. Some House lawmakers are aiming to stop the Agriculture Commissioner’s feral hog poisoning program at all costs and that includes adjusting the state’s budget so that funds cannot be used for a warfarin-based poisoning program in Texas. This month, Ag Commissioner Sid Miller announced he was bringing a “Hog Apocalypse” to Texas with the creation of a program that would allow farmers and ranchers to use the product, Kaput Feral Hog Bait, to poison feral hogs on their property. 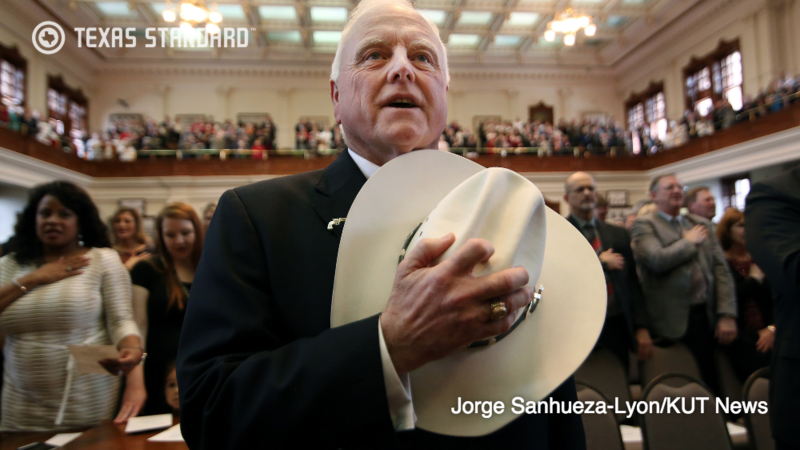 By now, most Texans are familiar with Sid Miller. Famous for his ever-present cowboy hat, the state agriculture commissioner – who's also a rancher and a Republican – has generated his share of controversy in recent months. But this week he's making news on his own terms with a commentary written for TribTalk, the editorial wing of the Texas Tribune.